46 inch diameter by 7 foot long autoclave / pressure vessel with a quick opening door and tagged for a 43psi working pressure. 5 overhead hot water spray headers and 2 underside steam headers. Came equipped with 37 inch long by 30 inch wide by 2.25 inch deep perforated stainless steel trays stacked 14 trays high. The Sumpot PLJ hot water spray autoclave operates by flooding the bottom of the tank with preheated water from a 2 foot diameter by 44 inch long overhead holding tank, and then steam heating that water which is continuously pumped up into the overhead sprays. The water collects and is reheated by a heating coil in the bottom of the vessel. The water continues to flow through the system until the cook cycle is complete. Manufacturer literature states that this stainless steel retort can be used to sterilize glass jars, cans, foil pouches, and plastic trays. As of this writing, this hot water spray retort is in stock at Alard, in very good to like new condition. EMPTY CAN DEPALLETIZER, DOUBLE HIGH, AUTOMATIC, with elevator doors, auto slip sheet remover, auto pallet stacker. 10 foot long power infeed conveyor. Automatic front doors on the pallet hoist. 5 foot wide by 20 foot long Intralox belt accumulating table. Powered can sweep mechanism / automatic sweep. 8 foot long empty pallet discharge conveyor. Allen Bradley Panelview 1000 touch screen control system. As of this writing, this bulk can depalletizer has been disassembled for inside storage (northeast US location), with all connections numbered for reassembly, and is available for timely shipment. IN STOCK at Alard, NEW fully assembled and available for immediate shipment. 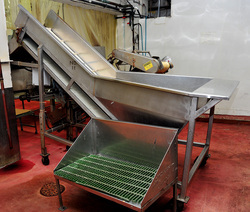 WASH HOPPER / DIP TANK with ELEVATING BELT CONVEYOR. 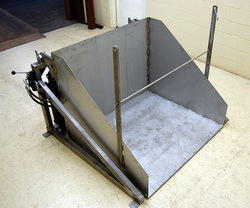 A Paul Kunz Co wet-hopper-feeder with a 56 inch wide by 50 inch long by 30 inch deep hopper configured to hold liquid. In the hopper is a incline / elevating conveyor 16 inches wide by 11 foot 6 inches long, with a plastic interlocking chain type belt, wtih 3/16 inch by 1/2 inch perforations, and 2 inch high cleats on 12 inch centers, running between 5 inch high conveyor sides. All food grade stainless steel construction. 53" high hopper infeed, discharge chute at 84 inch (7 foot) discharge height. 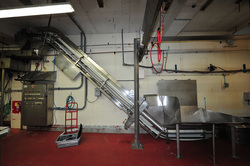 Spray bar over conveyor belt. 6 inch bottom tank cleanout, assorted Triclamp connections for water circulation. Complete with 1/2HP single phase gearmotor drive. As of this writing, this hopper-feed conveyor is in stock at Alard, in good condition, available for timely shipment. 40 INCH DIAMETER stainless steel ACCUMULATION DISK / FEED DISK, stainless steel. 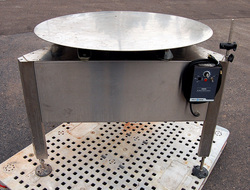 A 3 foot four inch diameter stainless steel turntable accumulating disk with underside trunnions for heavy loads, on a stainless steel base with threaded rod feet adjustable height for a 30 inch to 38 inch working height. Complete with a 110 volt single phase electrical input variable speed drive system. Rails can be added for use as an single filer / unscrambling disk, or for accumulation, for bags, jars, can, bottles, trays, cartons, tubs, or buckets. As of this writing, this pack-on / pack-off disk is in stock at Alard, without rails (but has rail mounts), but otherwise in very good operable condition, available AS-IS for immediate shipment, or can be serviced by our shop prior to shipment with rails and controller added. 60 INCH DIAMETER ACCUMULATION DISK / FEED DISK, stainless steel. 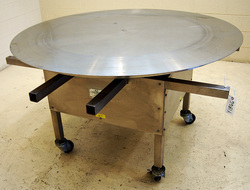 A 5 foot diameter stainless steel topped turntable accumulating disk with underside trunnions for heavy loads, presently set at a 36 inch working height on a stainless steel support frame, on locking rolling casters for portability. Complete with 90vDC gearmotor drive. As of this writing, this 5 foot diameter pack-on / pack-off disk is in stock at Alard, without rails (but has rail mounts), and needing a variable speed controller, but otherwise in very good operable condition, available AS-IS for immediate shipment, or can be serviced by our shop prior to shipment with rails and controller added. STAINLESS STEEL FOUR ROLL ABRASIVE PEELER / BRUSH WASHER / VEGETABLE SCRUBBER, for root crop vegetables. Set with (4) abrasive rolls, each 6" diameter by 6' long; but can be set with any combination of abrasive or poly brush rolls to buyer need / specification for stronger or gentler peeling / scrubbing action. Raw product is fed to the peeling chamber via a 15" by 26" top hopper inlet opening in the hinged stainless steel cover at a 57" infeed height. Lubricating and rinsing action is provided in the chamber by a stainless steel water spray pipe header with spray nozzles. Peeled product discharges through a stainless steel discharge flapper-gate which is adjustable so the product can be subjected to a longer or shorter peeling / washing exposure. 39" discharge height. Water, peels, and debris dropout through the open bottom of the peeler-washer. 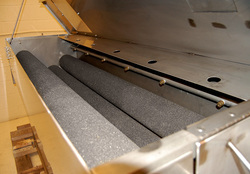 The abrasive/brush rolls are mounted parallel (in line) with product flow. Complete with a central lubrication cluster for ease of maintenance. Belt & pulley drive powered by a 3 HP 208/230/460 volt 3 phase 60 cycle constant speed motor drive. We can offer a "soft start" option with a new VFD and control box. (Be sure to ask your Alard representative for details and pricing on this option). As of this writing, this VERY slightly used demonstrator is IN stock at Alard, in LIKE NEW condition with four abrasive rolls, available for immediate shipment. SEMIAUTOMATIC CAN OPENER; --EDLUND Model825 extreme duty crown punch CAN OPENER. 32 inch diameter by 28" deep hemispherical bottom stainless steel vessel with hinged top cover, and 1.75" diamter front bottom outlet with manual valve. Manufacturer tagged, National Board coded and U stamped for 30psi at 300 degrees Fahrenheit. 55" infeed height, 24" valve discharge height. Presently set for natural gas, but could be converted to propane upon request. All food grade sanitary stainless steel constuction. 110 volt single phase controls. As of this writing, this 80 gallon gas heated cooking kettle is in stock at Alard, in excellent condition, available for timely shipment. OPTIONAL Hockmeyer paddle / overhead sweep agitator with 2HP 230 volt 3 phase drive and painted steel support frame available. 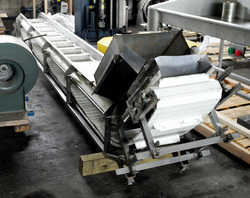 HOPPER - FEEDER - ELEVATING INFEED CONVEYOR, stainless steel. NOTE: Catwalk / platform stand (green) NOT included. 4 foot wide by 31 inch deep tapered infeed hopper with a stainless steel baffle over the belt to eliminate excess belt pressure, with a 24 inch wide by 9 foot long white food grade cleated rubber belt 1.5" high cleats, running between 9.75" high stainless steel sides. Configured a 48 inch infeed height and a 72 inch discharge height, but could be lowered by 7" with the removal of the casters. All food grade stainless steel construction. Complete with a 1HP 230/460 volt 3 phase gearmotor drive set to buyers voltage specification. Last used as a peeler feed conveyor in a freshcut vegetable operation. As of this writing, this hopper elevating feed conveyor is in stock at Alard in good condition, available for timely shipment. 1200 GALLON VERTICAL STAINLESS STEEL TANK. 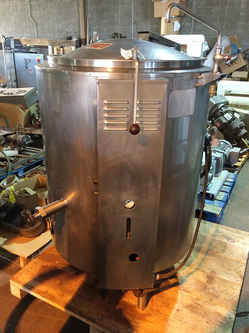 A round food grade stainless steel tank 84 inches in diameter by 47 inches deep, with an open top with a 2 inch wide top rim, and an 8 inch deep shallow cone bottom with a 4 inch diameter flanged center bottom outlet. On six (6) stainless steel legs set for an 84.5 inch infeed height, and a 29.5 inch discharge height. 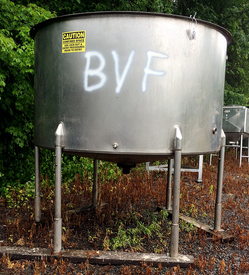 As of this writing, this 1200 gallon conical bottom stainless steel tank is in stock at Alard, in good condition, available for timely shipment. 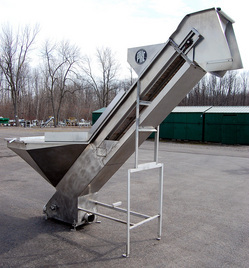 Z-SHAPED ELEVATING FEED CONVEYOR, 18 inches wide by 18 feet long, stainless steel. An S-shaped elevating belt conveyor with a 2 foot long horizontal infeed section (with small flared infeed hopper) leading to a 14 foot long incline section, leading to a 2 foot long horizontal discharge section. It has a 17.75 inch wide solid interlocking plastic chain type belt, with 2 inch high by 12.75 inch wide cleats (the cleats don't extend to the edges of the belt). There are 5 inch high stainless steel sides extending over the edges of the belt for a 15 inch usable belt width. Complete with full length stainless steel underpan, 3 phase gearmotor drive. Previously used as a feed conveyor for a radial combination scale. As of this writing, this gooseneck elevating feed conveyor is in stock at Alard, missing discharge end legs, and motor, but otherwise in good condition, available for timely shipment as-is, or can be service with new legs and motor installed. Z-SHAPED ELEVATING CONVEYOR, 18 inches wide by 18 feet long, stainless steel. S-shaped incline conveyor with interlocking chain type plastic cleated belt, with 1 inch to 1.5 inch cleats running between 4.5 inch to 8.5 inch high stainless steel sides. Begins with a 5 foot long horizontal infeed section, to a 14 foot 6 inch incline section, then ends with a 4 foot long horizontal discharge section. The incline section has a powered paddle 3 feet up from the infeed section. Tubular stainless steel frame with a adjustable feet, presently configured for a 12 inch infeed height, and 11 foot discharge height. Complete with a 1HP 3 phase drive. Previously used as a feed conveyor to a radial combination scale (not included). As of this writing, this gooseneck elevating feed conveyor is in stock at Alard,with a usable but worn belt, missing discharge end legs, and paddle motor, but otherwise in good operable condition, available for timely shipment as-is, or can be serviced with legs, paddle motor and new belt. NOTE: Hopper shown in pictures was removed and is not included. STAINLESS STEEL ELEVATING BELT CONVEYOR, 18 inches wide by 15 feet long, with cleated food grade plastic interlocking chain type belt with 2 inch high cleats on 8 inch centers running between 4 inch high stainless steel sidewalls. The belt has 1/8 inch oblog perforations that would allow water to pass through. Complete with 2HP 3 phase gearmotor with belt/pulley drive. As of this writing, this elevating conveyor belt is in stock at Alard, missing legs, but otherwise in good operable condition, and available for timely shipment. ELEVATING CONVEYOR with stainless steel frame, 18 inches wide by 14 feet long. A shallow incline conveyor, with a blue plastic interlocking chain type belt (not cleated) with 5/16 inch by 1/4 inch openings in the belt. The belt runs between 2 inch high UHMW sides which ride over the edges of the belt so product doesn't get around and under the sides. All tubular stainless steel frame. 38 inch high infeed, portable on 5 inch high casters, with telescoping legs on the discharge end, presently set at the lowest setting for a 47 inch discharge height. Hydraulic drive (power pack not included, was previously run from a central plant hydraulic supply). As of this writing, this elevating conveyor belt is in stock at Alard, in very good condition, available for timely shipment. Complete with factory electrical panel with safety Interlock system. 8 by 12 inch infeed hopper leads to a 5 inch diameter opening to the cutting chamber with 3 inch cutting head. 208/ 230 / 460 volt 3 phase electrical input, with Stearns brakemotor drive. Manufacturer offers a wide range of cutting parts for particle size reduction from coarse grinds to fine emulsions. 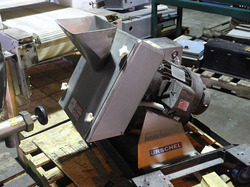 As of this writing, this Urschel model 3600 slant Comitrol grinder has just arrived into stock at Alard, needing cleanup and brake repairs, but otherwise in good operable condition, available for timely shipment.